"TB" redirects here. For the unit of information, see Terabyte. Chest X-ray of a person with advanced tuberculosis. White arrows point to infection in both lungs. Black arrows point to a cavity that has formed. Tuberculosis (TB) is an infectious disease caused by bacteria. In the past, people called it consumption. TB is caused by several types of mycobacteria, usually Mycobacterium tuberculosis. The disease usually attacks the lungs, but it can also affect other parts of the body. 4 How common is TB? The bacteria can travel through the air and spread from one person to the next. This happens when infected people cough, sneeze, or spit. Of every 100 people with TB, between five and ten people show symptoms. In these people, the disease is called active. Tuberculosis kills more than half of the people who are infected if they do not get treatment. Diagnosis of active TB relies on radiology. Doctors often look at an X-ray of the chest. In addition, they check body fluids. These fluids have microbes in them, which are grown in cell cultures. The cell cultures are then analysed to see if the person is infected with TB. If the patient has TB, but does not show symptoms, the disease is 'latent'. Doctors use a skin test, called the Mantoux test, to detect latent TB. They often do blood tests too. There is a vaccine against some forms of tuberculosis. It is called bacillus Calmette–Guérin vaccine. TB used to be easily treated and cured with antibiotics. However, the bacterium is now highly resistant to most antibiotics. This resistance makes treatment difficult. Many different kinds of antibiotics need to be given over a long period of time. There is a form of tuberculosis that is resistant to all drugs. People are also more likely to get tuberculosis if they live close to other people who have TB. For example, TB can spread easily in homeless shelters, prisons, and immigrant communities. This world map shows the prevalence of TB, per 100.000 people, as of 2007. Countries with more cases are shown yellow, those with fewer cases are shown in blue. The most cases were recorded in Sub-Saharan Africa, many occurred in Asia as well. Experts believe that one third of the world population is infected with M. tuberculosis. New infections occur at a rate of one per second. In 2007, about 13.7 million chronic cases were active globally. In 2010, about 8.8 million new cases developed and nearly 1.5 million people died from the disease, most of them in developing countries. The number of tuberculosis cases has been decreasing since 2006, and new cases have decreased since 2002. Tuberculosis does not happen at the same rate around the world. About eighty percent of the population in many Asian and African countries test positive for TB, but only five to ten percent of people in the United States do. People usually get tuberculosis because of a weakened immune system. Many people with HIV and AIDS can also get tuberculosis. ↑ 1.0 1.1 Kumar V. et al 2007. Robbins basic pathology (8th ed.). Saunders Elsevier. pp. 516–522. ISBN 978-1-4160-2973-1. ↑ Konstantinos A (2010). 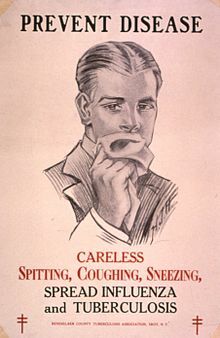 "Testing for tuberculosis". Australian Prescriber 33 (1): 12–18. http://www.australianprescriber.com/magazine/33/1/12/18/. ↑ 5.0 5.1 "Tuberculosis Fact sheet N°104". World Health Organization. November 2010. Retrieved 26 July 2011. ↑ World Health Organization (2009). "Epidemiology" (PDF). Global tuberculosis control: epidemiology, strategy, financing. pp. 6–33. ISBN 978-92-4-156380-2. Retrieved 12 November 2009. ↑ 7.0 7.1 World Health Organization (2011). "The sixteenth global report on tuberculosis" (PDF). ↑ Lawn, SD; Zumla, AI (2011). "Tuberculosis". Lancet 378 (9785): 57–72. doi:10.1016/S0140-6736(10)62173-3. PMID 21420161. This page was last changed on 6 May 2018, at 19:16.